No. I had never heard her music before. She does not belong to my generation (or is it I who do not belong to hers?). But I knew of her. I often saw pictures of her on ghanaweb and other Ghanaian internet hubs. She was easily identifiable by her special hair style (thank goodness she was not using “Brazilian hair” like so many other black women who envy the long hair that nature did not give them). How apt that a star called “Ebony” was not wearing long foreign hair that made her look like a bimbo! She did not seem to ever wear a brazier. Or, did she? They tell me after her interview with someone called Delay(?) she started wearing it – at times. But that was her brand. How much of it was her own and which the machinations of her handlers, I do not know. So I, too, knew who Ebony was even though I have been so far away from home for so long. Then we heard of her sudden death. I did not know she was that young. Then I listened to her music. And it was nice! I asked my young nephews and nieces in Ghana if they knew the music of Ebony. And they all, to a voice, told me: yes, everybody listens to Ebony’s music. And some of these my nephews and nieces, millennials like Ebony herself, are youngsters who detest much of the new music in Ghana, calling it derogatorily “azonto” music for low class people. They told me even university students liked her, especially the boys. She often performed for them on campus. And they listen to her on Spotify and on other music streaming sites. I could not find her on Apple Music, though. Is she there? I belong to an age group that thinks the best music has already been played – the one that MY generation grew up with. We, who often mistake generational differences for a lowering of quality (oh, today’s music is just noise…; oh, today’s degrees are cheap; ah, today’s graduates cannot “string one correct sentence in English”; oh, everything was better before, blah blah blah…) and think that our children and their children should continue listening to the music that we enjoyed in the 60s, 70s and 80s. What arrogance on our part! I listened to Ebony’s music and it was good. It did not take me long to discern a certain maturity in her music that is beyond her tender age – even for me of my generation. I talked to the elderly in Ghana and they also like her music. It seems the only groups of Ghanaians who do not enjoy her music are the Chrife and fundamentalist religious people that are now so many in our country. They do not listen, not because of the quality of the music but, perhaps, because of the “non-Christian” personality of the singer and her lyrics. They will not describe her visual image and stage persona and the words that come out of her mouth as belonging to someone destined for heaven. Well, that is their loss. Because she died so young, her repertoire is not large. Let me leave the analysis of her songs to younger writers who know that better than I do and hope they can do a scholarly work on that. So far, the write-up has been mostly about the silly pronouncements of the prophets of doom, the manner of her death, and the poor nature of our roads linking the whole to the mess that is our country. But we need proper analyses of the music and the lyrics too. What is most painful, of course, is her dying at such a relatively young age and the manner of death – the avoidable vehicular accident! We all feel that she did not have to die. Nobody that young should die. But die she did. And she did not even make it to the Club of 27 – that club of “popular musicians, artists, or actors who died at age twenty-seven” (Wikipedia). Members of the club include Brian Jones, Jimi Hendrix, Janis Joplin, and Jim Morrison who all died between 1969 and 1971 each aged 27. Younger readers of this piece will not be familiar with the music of these great musicians all of whom are still cult figures today. Curt Cobain of Nirvana (Smells Like Teen Spirit…) also died at 27 in 1994. Then Amy Winehouse died at 27 in 2011. In Africa, there was the shocking death of Bella Bellow (Rockiaaaa…) in an accident in Togo in 1973 shortly before she turned 28. 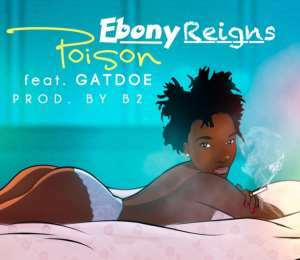 Will Ebony also become a cult figure in Ghanaian popular culture? She has all the markings of that – the distinctive personality, unique music and the tragedy of dying before her time (cult figures seem to have a morbid talent for dying young…) In time, she will also be remembered for what great music she could have made if she had lived and each of the tracks she left behind will forever become gems. The Nazis would have been proud of Ghana’s referendum results! Amanpour’s CNN programme was a lot more than just about Moesha! Moesha’s lover is being over-charged for the services he is receiving! Wo Ye Ghananii, Enna Wonnte Twi? I May Vote For Npp … But Not For Akufo-Addo!